Here we are at the start of another Lent, recognizable by these facts: it’s 3:20 pm and I’m starving with no hope of a meal for hours, and there is schmutz on my forehead. Blessed schmutz, even holy schmutz, but schmutz nonetheless. 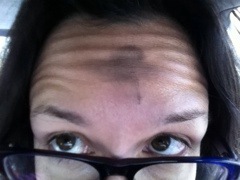 There’s an ongoing debate for many of us on Ash Wednesday…to wash or not to wash the ashes off our foreheads? In the gospel reading today, Jesus was pretty clear. “Don’t perform righteous deeds so that others may see them.” “Don’t pray like a hypocrite.” “Wash your face.” (I’m not kidding. He actually said “Wash your face.”) Given the clarity of those instructions, why is there a debate you may well ask? Well, I don’t know. But I’m not washing mine off and here’s why. I’m uncomfortable with them on, and I think we should be a little uncomfortable during Lent. A little hungrier in both body and mind, a little more conscious of our mortality, and a little more aware of our failings. If you’re leaving your ashes on so everybody knows you’ve gone to church and you’re a good, holy person, well, maybe go home and wash them off. If you’re like me, and you’re uncomfortable wearing your faith on your sleeve, maybe once a year you can do it anyway. Hence the schmutz. Father Jeff spoke about the ashes as a sign that we’re all in this together. So, if you’re out and you see a perfect stranger with the schmutz on their forehead, you can smile, and perhaps say hello, if not utter a silent prayer for them. That last sentence was my thought – not Father Jeff’s.